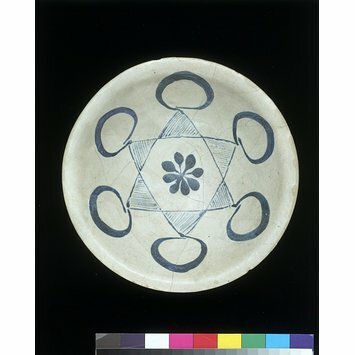 Glazed ceramics were not widely used in the pre-Islamic Middle East, but in the 8th and 9th centuries, they began to assume the important role they have today. High-fired ceramics from China, first brought to Iraq by sea in the 8th century, were one stimulus for this change. 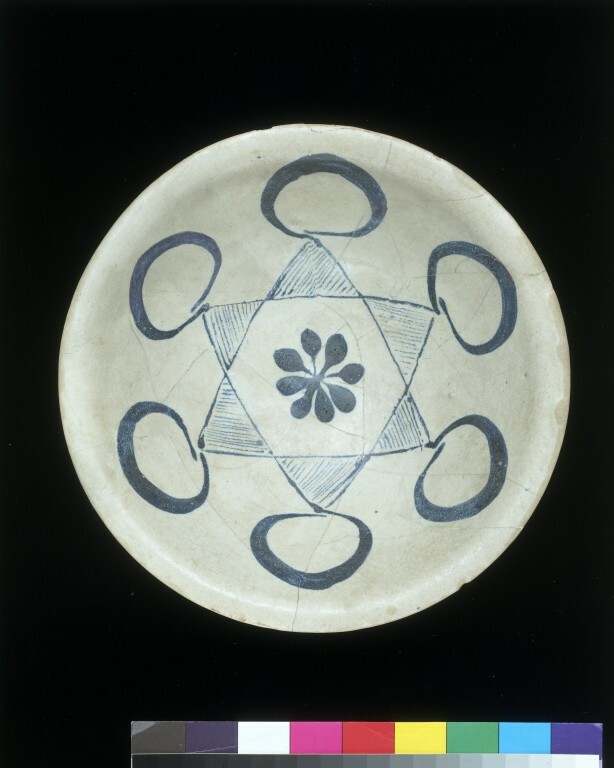 In the early 9th century Iraqi potters began to imitate elegant white bowls imported from China. They used the local yellow clay, which they masked with an opaque white glaze. Soon they began to add new forms and decoration of different types in blue, green and metallic lustre. Once Iraqi potters could successfully imitate Chinese whiteware, they began to treat the white surface of their ceramics as a blank canvas. Painting into the glaze in cobalt blue was a local innovation, which resulted in the world's first blue-and-white ceramics. Purchased for £13.10.0 from A. Garabed, 41 Chipstone St, W1. Garabed was an Armenian dealer who sold Islamic wares to the British Museum and the V&A, c. 1923-58. Long-haul trading voyages to China were underway from as early as the eighth century, and Chinese porcelains were imported into the Abbasid imperial cities. These porcelains were so admired that Islamic potters began to experiment with imitating their bright whiteness, and consequently invented the technique of opacifying the glaze by adding particles of tin. This provided a blank ‘canvas’, to which the potters soon began to add decoration in cobalt blue. The Abbasid wares have long been thought of as the world’s first blue-and-white, though it is still unknown whether or not ninth-century Chinese ceramics with blue decoration came first. Bowl, whiteware with blue-painted geometric design; Iraq (probably Basra), 9th century. Splashed decoration in copper green and other colours was inspired by Chinese models, but painting into the glaze in cobalt blue was a local innovation, which resulted in the world’s first blue-and-white ceramics. Once Iraqi potters could successfully imitate Chinese whitewares, they began to treat the white surface of their ceramics as a blank canvas. Splashed decoration in copper green and other colours was inspired by Chinese models, but painting into the glaze in cobalt blue was a local innovation, which resulted in the world's first blue-and-white ceramics. White-glazed earthenware painted in blue.